Four Seasons Hotel Firenze, Italy. Four Seasons Hotel Firenze, Florence, Italy ranked #48 in our countdown of the 100 Best Hotels and Resorts in the World. The 15th-century Palazzo della Gherardesca is awash with historical paintings, Murano glass chandeliers, sculpture and art, crested furnishings, acres of gilding and miles of bas relief. 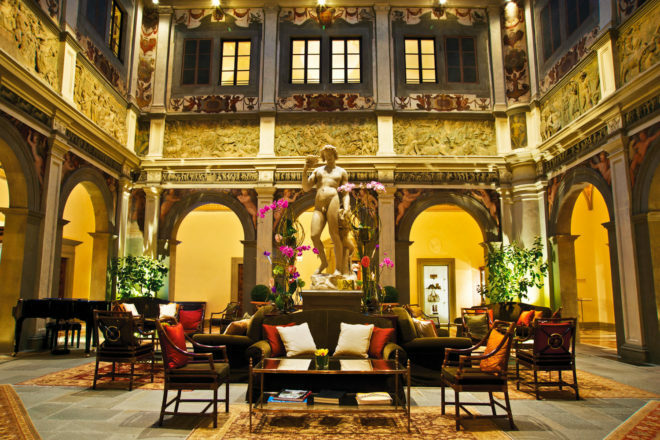 Painstakingly restored, the hotel envelops guests in Medici-like magnificence while catering to every modern need. Statues, fountains and follies are dotted through 11 acres of shady botanical gardens. And there’s an amazing spa to unwind at the end of the day. Chianti wine massage? Yes, please. Did you know The spa’s herbal treatments are from the Officina Profumo – Farmaceutica di Santa Maria Novella, one of the world’s oldest pharmacies, founded by Dominican Friars in 1221.